Constipation can cause you to experience intestinal discomfort and increase your risk of developing hemorrhoids. According to the National Digestive Diseases Information Clearinghouse, a high-fiber diet contributes to regular bowel movements and helps to prevent and treat constipation. Lentils contain soluble fiber, which not only helps with constipation, it also helps reduce your risk of heart disease. Eat lentil soup for a high-fiber meal to help you have regular bowel movements. Constipation occurs due to a variety of factors. If you have no bowel movements in a week, or only one or two, you are constipated. Constipation occurs when matter moving through your digestive system slows due to hormones, age, pregnancy or lack of fiber in your diet. A diet high in fiber can improve the efficiency of your digestive system and help to keep your bowel movements soft. One cup of lentils contains 30.5 g of fiber, according to the U.S. Department of Agriculture. 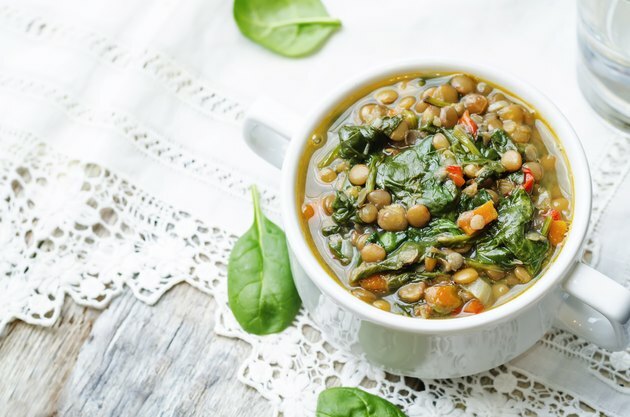 The typical American diet is low in fiber, so 1 cup of lentil soup goes a long way toward meeting the recommended daily amount of fiber, which is 25 to 35 g, according to the American Dietetic Association. Lentils contain soluble fiber, which is the type of fiber that turns into a gel when it becomes wet. Soluble fiber blocks the absorption of dietary cholesterol and reduces your risk of heart disease and high serum cholesterol. Insoluble fiber is the part of fruits and vegetables that passes through your intestines undigested. This type of fiber forms the bulk of your bowel movements and helps to keep the matter moving well through your intestines. One of the advantages of preparing and eating lentil soup is that you can add a variety of vegetables and increase the amount of insoluble fiber in your diet. Lentils do not need to be soaked prior to cooking, so you can prepare lentil soup more quickly than making soup with other legumes. Add cut up carrots, zucchini and cabbage to your lentil soup to increase its fiber. You can experiment with different seasonings, such as basil or curry, to vary the flavors in your soup. Use chicken stock for added flavor or substitute vegetable broth to prepare a vegan dish.